What is your #VOWhy? Well, what is a VOWhy in the first place? 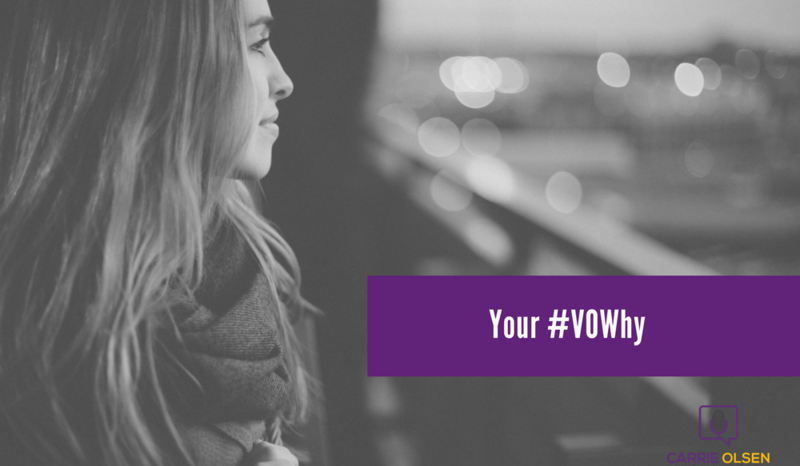 VO stands for voiceover and a #VOWhy is your reason for wanting to get into, or for staying in the voiceover industry. So again, what is your #VOWhy? I’m bringing this question up in today’s post because keeping your #VOWhy in mind will increase your chances of becoming a successful voice actor. It will give you purpose and direction that will make your voiceover journey more meaningful and more exciting, versus just going through the motions and not being clear on why you’re doing voiceover in the first place. If you lack a strong reason for being in this industry, it’s very possible that you won’t be here for long, and that you won’t have much success in it. Knowing why you’re doing what you’re doing and why you’ve set the goals that you’ve set will fuel you to keep moving forward despite the challenges or hurdles that you will encounter. I’ve talked to people who have been in the industry for decades, and they say that every time there is a slow day, they're wondering if they're ever going to work again. So I know that there's some anxiety that just comes along with being self-employed. And even though our work is awesome, and there’s so much fun to be had when we're doing voiceover work, sometimes, some days -- it does feel like work. And maybe for some of you, it feels like work most days. Because, of course, it IS work. Although hopefully, it's work that you really, really enjoy. Now because sometimes you don't feel as "into it" as you'd like to, keeping your #VOWhy in front of you is crucial. Your #VOWhy -- your purpose for getting into the voiceover business -- will help boost your energy, your courage, and your determination to continue on your journey. If your #VOWhy is very vivid in your mind, you have a compelling reason to keep pushing yourself -- even when it feels easier to give up -- so that you can reach the goals you’ve set out to achieve. What possible #VOWhy can you have? It depends on you -- it can be to keep food on the table for your family, to get out of your 9 to 5, a financial goal that you want to meet, your initial love for voiceover or for performing, your dream of working from anywhere, your desire to spend more time with your family, and more. Whatever it might be that is driving you, that’s what you can keep coming back to when you experience those hard days. If we're not intentional about keeping our #VOWhy in mind, it's easy to lose sight of the goal that we’re trying to achieve in the first place. So I think it's important to always keep your #VOWhy in front of you. I recommend putting it in front of you physically. If you are crafty (or even if you're not), get a piece of poster board, or a sticky note, or an 8.5 x 11 piece of paper (I guess the size and type of paper doesn't really matter...), then write down your #VOWhy. Put it on your mirror so you see it in the morning, or somewhere else where you're going to see it. 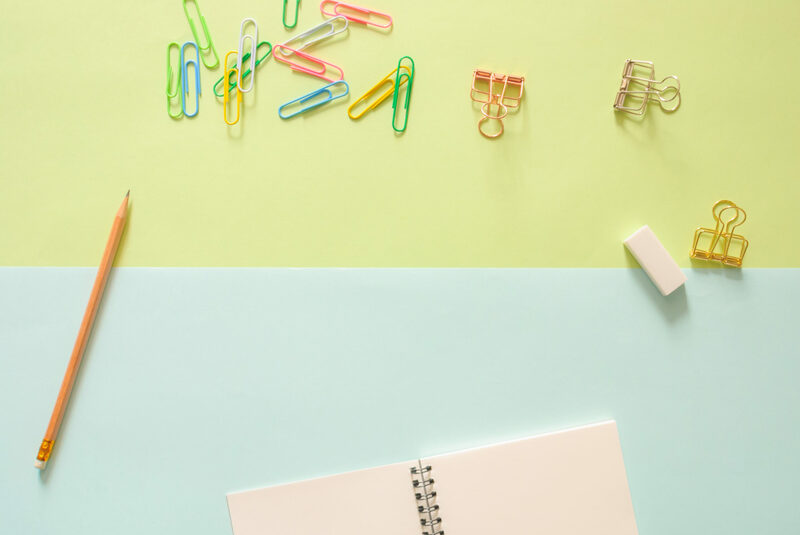 That's going to help you to stay motivated and help you to take those next steps on the days when you don't feel like practicing, you don't feel like auditioning, you don't feel like reading, or you don't feel like studying. That #VOWhy can help motivate you to do the things that you need to do, to keep your goals in reach, and to keep moving towards your next step. Now, If you're not crafty (or you just don't give yourself enough credit), do something different. For example, if you’re wanting to buy a house -- print out a picture of your dream house and keep that in front of you so that it can serve as motivation for you to keep going. Don't just keep your goals to yourself. I'm guilty of this because I tend to not share my goals until I've achieved them. But make a bold statement with your goals. Tell your friends. Ask someone to keep you accountable. Give yourself the best chance of achieving your goals by getting support from other people. So go out there and let the universe know what your #VOWhy is! One great place to share your #VOWhy is in the Voiceover Start-up Facebook group. There’s a thread in there right now that is asking for your #VOWhy. If you're not in that group yet, I encourage you to join the group by clicking here. Find that thread or start a new one, and tell us what your #VOWhy is. Doing that within the group allows you to become a part of a supportive community, to get accountability, and to hear from people who have similar #VOWhys to yours. You can also connect with them and keep tabs on them as you all journey towards your voiceover goals. Want to know how to get started in voiceover? If you're in that spot where you're just really wanting to explore voiceover and what it might look like to get started in the industry, I would love for you to attend my free one-hour webinar on getting started in voiceover. 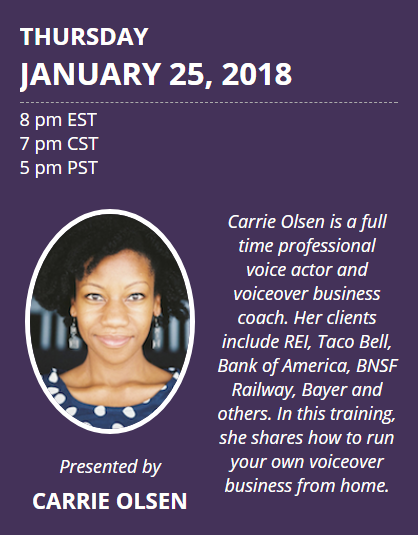 The Voiceover Start-up webinar is great for aspiring voice actors and for those new in the voiceover industry who are still looking for trustworthy guidance, answers, and information on how to get a solid start in the business. If you'd like to join this free webinar, just click the button below to sign up, and I’ll see you there!